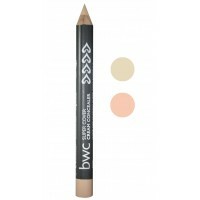 Beauty Without Cruelty Mineral Duo Blusher Pressed - Sweet Apricot is a light powder which give an even silky soft application for longlasting colour accents - the two tones enable highlighting as well as a more natural blending effect. 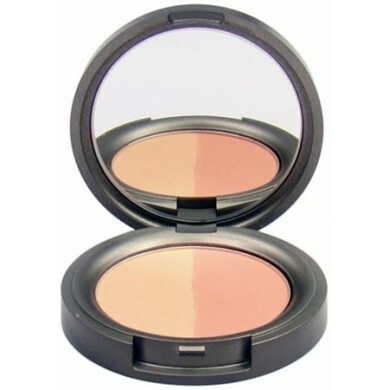 Talc-free and with removal of standard irritants normally included in blusher formulations such as bismuth oxychloride makes this the ideal choice for sensitive skin. 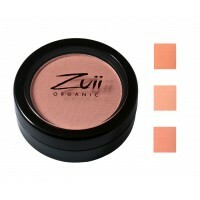 Shade Description: Sweet Apricot is a duo of soft apricot tones, one more peachy and one a lighter apricot. Ingredients Shade 1 (Pale) Kaolin, Mica, Caprylic/CapricTriglyceride, Tapioca Starch, Ultramarines, Magnesium Stearate,Titanium Dioxide, Silica, Corallina Officinalis Extract, Glyceryl Caprylate, Iron Oxides, Benzyl Alcohol, ManganeseViolet, Helianthus Annuus (Sunflower) Seed Oil, Rosmarinus Officinalis (Rosemary) Leaf Extract. Shade 2 (Deep) Kaolin, Mica, Ultramarines, Caprylic/Capric Triglyceride,Titanium Dioxide, Magnesium Stearate,Tapioca Starch, Silica, Iron Oxides, Glyceryl Caprylate, Corallina Officinalis Extract, Benzyl Alcohol, Helianthus Annuus (Sunflower) Seed Oil, Rosmarinus Officinalis (Rosemary) Leaf Extract. 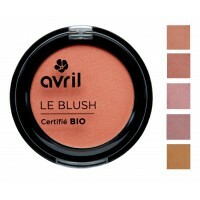 Avril Certified Organic Blush is a certified natural blusher perfect to sculpture, add a touch of co..
Zuii Organic Flora Blush delivers simple and effective Talc Free colour tones reinforced with..